Dachshund Characteristics: The tenacious and frisky Dachshund is a breed of small dog classified as a member of the Hound Dog Group (AKC:1885), a Scenthound. The Dachshund, is characterized by its short-legged, distinctive "sausage dog" appearance with a long, tapering, elongated head and bold expression. Other characteristics include medium sized, oval shaped, slanting eyes; broad, triangular shaped, pendulous ears; a well-muscled body, long, muscular neck and a fluid gait. 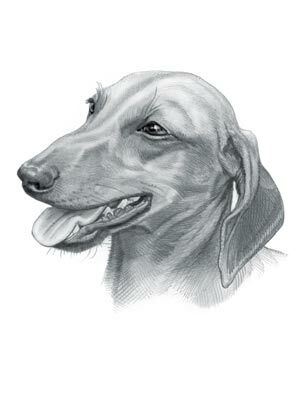 The temperament of the Dachshund can be described as Courageous, Lively, Stubborn. The coat type of the Dachshund is described as varied coat (wired, short, long) in assorted colors. Due to its characteristics and qualities, the Dachshund demonstrated the desired traits of a Hunting Dog and is known by its nick name the "Hot Dog". The origin of the Dachshund dog breed was in Germany where it was developed in the 1050's. Dachshund Breed Group and Dog Type - Hound Dog Group (AKC:1885), a Scenthound: The Dachshund is one of the many breeds of dogs that belong to the Hound Dog Group (AKC:1885), a Scenthound. According to AKC standard, there are two sizes of Dachshund, the Standard and Miniature, however the AKC, Europe also recognizes the Toy dog. Origin of the names: The German word Dachshund is derived from a combination of the German words 'hund' meaning dog and 'dachs' meaning "badger" (the Dachshunds were originally trained to hunt badgers). The name 'Wiener Dogs' is a reference to the long, thin bodies of the Dachshund, which are reminiscent of sausages, which in turn led to the nicknames Hot Dog and Sausage Dog. Other names for the Dachshund: The Dachshund is known by the nickname of the "Hot Dog". Other names for this breed of dog include the Dashie, Sausage Dog, Wiener Dog, Little Hot Dog, Hotdog and the 'Dash It Hound'. Dachshund - Scent hound: The Dachshund is a Scent hound, one of the hunting dog breeds, built for endurance, with deep, open nostrils that enable the canine to pick up scent particles and track small game, especially the badger and was later used to track the prairie dog in America. The Dachshund is adept at getting in and out of bolt holes. Dachshund History and Origin: The country of origin of the Dachshund breed was in Germany during the 1050's. The short legged, long bodied Dachshund was originally bred to hunt badgers (Dachshund means "badger dog" in German). The Dachshund scent hound breed was skilled at tracking its quarry and its shape and size made him a perfect dog to chase its prey into its burrow, den or bolt hole. The Dachshund was trained to 'flush out' the animal and either kill the prey or corner it for the hunter. The highly successful "badger dog" was also used to hunt other small game such as the fox, stoat, weasel and rabbits. The brave little Dachshund was also known to hunt the ferocious wolverine and the equally dangerous wild boar. The German gamekeepers and foresters introduced a selective breeding program to reduce the body size of the Dachshund creating a miniature version of the Standard Dachshund. Their objective was to develop a Dachshund could go into rabbit holes or the dens of smaller game more easily. The German gamekeepers categorized the different Dachshund dogs by the size of hole it could enter and based on the chest circumference of the dog. The Standard Dachshund (Normalgrossteckel), the Rabbit Dachshund (kaninchenteckel) and the Dwarf Dachshund (Zwergteckel). ('Teckel' is another word meaning Dachshund). The Dashie was jokingly referred to as the "the dog that is sold by the yard" and was exported across many European countries. The Dachshund was officially recognized by the American Kennel Club (AKC) in 1885. Dachshund Modern History: The modern history of the Dachshund moved on and the breed is now enjoyed as a protective family pet and companion, although it can be snappy with strangers and it still loves to dig!. Dachshund - The Ugly Dachshund (1966 movie): The Disney movie called 'The Ugly Dachshund' (starring Dean Jones and Suzanne Pleshette) is the story of three adorable dachshund puppies who live with a massive Great Dane named Brutus, who also thinks of himself as a dainty Dachshund - hence the 'The Ugly Dachshund' title. Dachshund Height: The Dachshund breed is classified as a small sized dog. The height to the shoulder of a male dog is 8-11 inches (20-27 cm). The height to the shoulder of a female dog is slightly less. Dachshund Weight: The weight of this small sized dog, in a male dog is 11+ pounds (4.9 kg). The weight of the smaller female dog is slightly less than the male. Dachshund Coat Type - LOW shedding coat: There are three varieties of Dachshund; the short-haired Dachshund, the wired-haired Dachshund, and the long-haired Dachshund. The term "Wire" refers to hair that is coarse and that facial furnishings are present. Dachshund Coat Colors: The colors of this dog breed consist of assorted colors consisting of Black, Chocolate, Red, Blue, Cream, Tan, Chocolate & Cream and Black & Tan. N.B. The term "Red" refers to reddish shades of orange, brown, and tan colors. The word "Blue" is used to describe a cool-toned, metallic gray color. Dachshund Grooming - LOW to MODERATE Grooming Needs: The Smooth (Short haired) Dachshund has low groom requirements whereas the longhair Dachshund requires a little more (moderate) attention. The dog grooming needs of the Smooth (Short haired) Dachshund are categorized as Low in order to maintain a healthy coat and reduce the risk of skin infections. The limited dog grooming needs of the dog are therefore considered to be low maintenance, requiring limited attention to grooming with casual brushing and combing. Dog Grooming needs should also include bathing the dog on a monthly basis and making regular inspections of the eyes, ears, nails and teeth. Dachshund Litter Size: The litter size of this dog breed ranges from 4-6 puppies. Dachshund puppies for sale can be obtained reputable breeders and from rescue centers. The cost of Dachshund puppies varies depending on location, pedigree history and the dog breeder. Dachshund Temperament and personality: The temperament and personality of this popular dog breed is described as Tenacious, Courageous, Lively, Stubborn and Frisky. Dachshund Exercise Requirements - LOW Exercise Requirements: The exercise requirements of this breed of dog is low. The Dachshund requires regular daily exercise consisting of approximately 30 minutes to one hour every day. This small dog has a jaunty, fluid gait with small strides and only requires a fairly slow speed by the owner to meet the dogs exercise requirements. Remember that it would take a lot of extra steps by your dog to keep up with your normal walking pace. Dachshund Diet: A fully grown Dachshund should be fed twice a day. A diet consisting of a premium dog food can be balanced with fresh food eaten by the family. The question is What Can Dogs Eat?. Check out our comprehensive list of what dogs can and what dogs cannot eat. Dachshund Health Problems: Potential health problems of the Dachshund breed include Gastric Torsion, Intervertebral disc disease, Patellar Luxation. Resolving health problems can prove to be expensive and it is always wise to obtain pet insurance or dog health insurance when buying a dog. Is the Dachshund dog breed said to be Hypoallergenic? Answer: No. Dachshund Lifespan: The life expectancy of dogs vary according to the size, breed of dog and any serious health problems. The typical lifespan of the Dachshund breed is 12-14 years. Dachshund Male Dog Names: Male Dog names are most often chosen to reflect favorite names of the owner or the strength, size, coloring and country of origin of the breed. To give you some inspiration regarding good male Dachshund names our small selection might be of help with naming boy dogs. Our top male dog names are: Bruno *** Dolf *** Fritz *** Guthrie *** Milo *** Zelig *** Pumpkin *** Goober *** Max *** Gus *** Nipper. Dachshund Female Dog Names: Female Dog names tend to be softer, prettier and reflect the temperament of the girl dog. Our top choice of good female names are Velma *** Helga *** Ebba *** Sassy *** Sheba *** Maddy *** Trudy *** Heidi *** Daisy *** Bambi.